You are Simply Aw-Mason! - C.R.A.F.T. Did y’all give Carisa’s painting idea for kids a try? It’s such a fun, simple craft project for the kids to do this summer. Today, she’s sharing a free printable to use as a thank you gift. Y’all know I love cheesy sayings, so this post is one of my faves! It’s perfect to use for coaches, teachers, co-workers, or anyone else you want to thank. Don’t forget to hop over and check out all of her other amazing ideas on Messes to Memories. And for the record, I think y’all are aw-mason! Carisa here! I’m back with such a cute and super simple idea to help you thank those special people that have made a big difference in your life! There are so many amazing people in my life that I want to thank all the time. Ever since leaving home and moving across the country I’ve missed all my close family and friends. I’ve definitely had to let go of my independent and stubborn self to ask for help every once in a while. And luckily, there have been Ah-Mason people around me that have been there for me and my family! I wanted to put together a cute, simple gift to share with a few people that have touched our lives including Lanae’s teacher. It’s important to me to let my kid’s teachers know how much we love and appreciate all of their efforts. That’s where this Simply Ah-Mason gift came to play! I love mason jars. 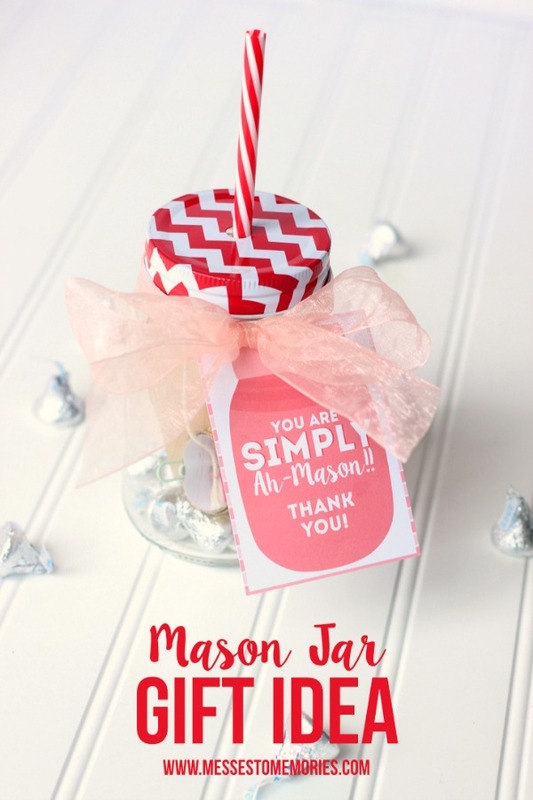 They are just so cute and useful… so filling up a mason jar with something fun seemed like the perfect simple gift for our favorite teachers. We filled our mason jar up with chocolate -DUH! and some cute teacher-y stuff… paper clips, sparkly clothespins, bright washi tape, etc. 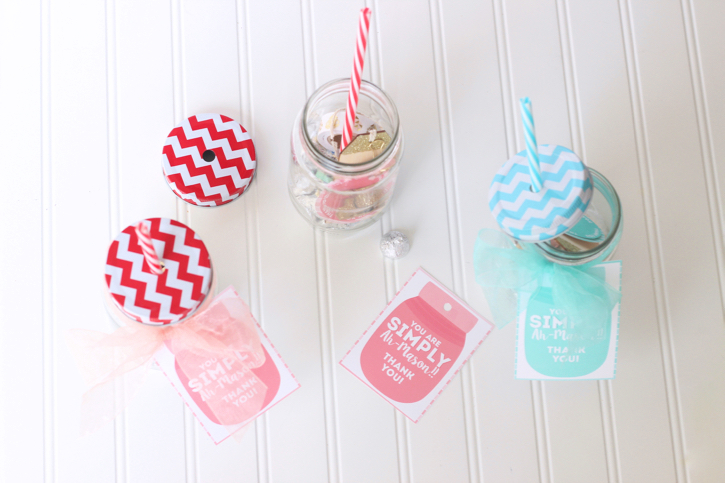 all in one cute little mason jar cup that comes with a a lid and straw. I found these at the Dollar Tree! Perfect, right? 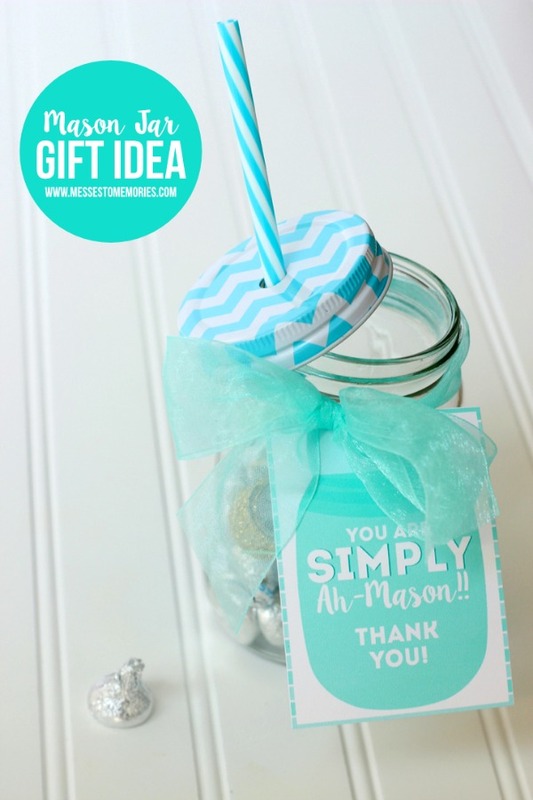 You could fill one of these jars up with just about anything and make this gift work for anyone you know! Heck, just fill it full of chocolate and you’ll be golden. baking supplies: measuring spoons, cookie cutters, cupcake liners, etc. pedicure supplies: nail polish, cotton balls, toe separators, nail file, buffing block, cuticle pusher, etc. pampering supplies: sugar scrub, lip balm, lotion, etc. craft supplies: ribbon, twine, colored or patterned tape, sparkly glue, etc. your favorite recipe: cookie mix, brownie mix, hot cocoa mix, are you getting the idea here? Stop by Messes to Memories for more fun gift ideas like this one… Here are a few of our favorites: Made With Love Gift Tags, Lego Themed Gift Basket, or our fun Heart Fingerprint Project that can be used as a gift and a fun keepsake!